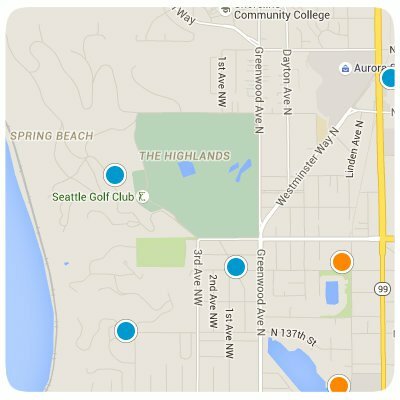 SearchHomesNW | Seattle-The Highlands Real Estate-Easily search the MLS for all The Highlands homes and condos for sale. Just North of Seattle is The Highlands, located on the Puget Sound. The high-end homes in this neighborhood are well-known for their beauty, but very rarely do Seattle locals visit due to the sense of privacy and seclusion from the larger Seattle area. The community is gated and falls between the Seattle Golf Club and the beautiful waterfront. The acreage of the Highlands properties begins at around two acres, and the majority of the homes are historic colonials and tudors from the early 1900s with a few more modern styles intermixed. Long private driveways and thick wooded streets offer homeowners a peaceful place to call home. Homes for sale in The Highlands vary: there are Condos For Sale In The Highlands, Town-Homes For Sale In The Highlands, and Single-Family Homes For Sale In The Highlands. There are many New Homes For Sale In The Highlands and many under construction. Thank you for using SearchHomesNW.com to find 30% more listings than Zillow, Trulia, and Realtor.